The efforts of youth across the country this month and in February have showcased the power of youth when they mobilize around a cause for which they feel passionate, such as school safety, and leaders are paying attention. On March 7, emergency preparedness leaders from various sectors gathered in Salem, OR, to discuss how agencies can use the passion, energy, and engagement skills of youth to enhance whole community preparedness. The Readiness and Emergency Management for Schools (REMS) Technical Assistance (TA) Center’s Project Director joined this Youth-Serving Organizations Leadership Roundtable, which was hosted by Region 10 of the Federal Emergency Management Agency (FEMA), and sat on a panel of leaders from agencies and organizations including but not limited to the Office of the Governor; Oregon Departments of Education and Human Services; local emergency management agencies; school districts; and local chapters of the American Red Cross, Girl Scouts, and Boys & Girls Clubs. Among other topics, the panel discussed steps organizations and agencies are taking to build disaster preparedness capabilities that specifically impact youth and how to engage youth-serving organizations on preparedness. Our Project Director brought home various considerations that we plan to keep in mind as we create materials and host virtual and live trainings to support the field. Many panelists noted that there could be higher levels of youth preparedness if there were higher levels of teacher and staff preparedness, and one of the primary needs expressed was training for teachers on emergency management topics. (The REMS TA Center offers self-paced specialized training packages and online courses that school emergency managers can use to train their colleagues or to brush up on their own knowledge regarding special topics in school emergency management.) Other roundtable participants expressed the need for support with handling disaster cache materials. 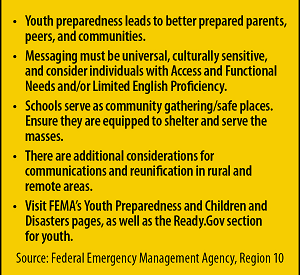 Find a snapshot of some additional key takeaways shared by FEMA Region 10 in the graphic to the right. Are you hosting a state or local event focused on school or campus safety and emergency preparedness? We’d love to send materials for support or attend if we can! Email us details to info@remstacenter.org so that we can discuss details. Spring is here next week and many schools and campuses are closed or will be closed. There are many things education agencies on the K-12 and higher ed levels can do to enhance preparedness in collaboration with staff, students, and community partners. Can you respond “yes” to any of the questions below? Check out our recommendations to support planning. Natural surveillance: Arranging physical features to maximize visibility. Natural access control: Guiding people with signage, well-marked entrances and exits, and landscaping while limiting access to certain areas by using real or symbolic barriers. Territoriality reinforcement: Clearly delineating space, expressing pride and ownership, and creating a welcoming environment. Management and maintenance:	Ensuring building services function properly and safely, and the exterior is properly maintained and organized with landscaping and plantings maintained and trimmed. Is your school or campus located in an area that is a high-traffic spring break destination? Work with the local emergency management agencies to ensure that you have plans to handle the overload of visitors that may be on or near campus. Ensure that campus police officers and local law enforcement understand your needs to increase or adjust security. Will there be students and staff remaining on your higher ed campus during spring break? Reach out to those students who remain on campus during spring break to see if you can enlist them to be champions for drills, exercises, and other emergency preparedness activities. Download our NEW mobile app SITE ASSESS to support your CPTED and other site assessment efforts planned for 2018. School and campus safety is enhanced when those supporting education agencies with prevention, protection, mitigation, response and recovery understand how schools, school districts, and institutions of higher education (IHEs) handle unique aspects of planning. Our School and Campus Safety Questions of the Month are designed to glean perspectives from the field on key areas of interest in school and campus safety and emergency preparedness. Each month, the topical focus of those questions will change, often mirroring the focus of Webinars we are hosting, resources we are developing, and/or trends in the field. Log on to the CoP today to visit the K-12 Public Forums and IHE Public Forums, where the School and Campus Safety Questions of the Month forums are housed. View a preview of the January, February, and March questions below. January: What community partners would you turn to if you needed volunteers to support your school or campus during or after an emergency? February: What training do you provide to school bus drivers or campus shuttle bus drivers on responding to emergencies? Do you provide ongoing professional development opportunities for them to learn more about emerging safety, security, and emergency management issues? March: Does your school, school district, or campus receive funding from nongovernmental sources such as philanthropy, foundations, NGOs, and fundraising programs, to support safety and emergency management? What are your other sources of funding support for preparedness (e.g., training and exercises hosted by community partners)? Not a member of the REMS TA Center’s CoP? Join today! After answering the question of the month, introduce yourself to the community by visiting the Community Huddle section. 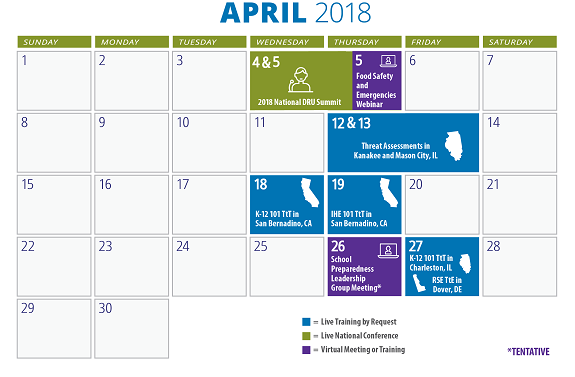 Since January, we have traveled to Arizona, California, Indiana, Nevada, New Hampshire, New York, Ohio, and Oregon to conduct live train-the-educator and train-the-trainer trainings on emergency operations development, earthquake preparedness, resilience strategies, and threat assessment. We have also visited Chicago, IL; Salem, OR; and various cities in Texas to engage, present, and distribute materials at national and local safety events including the National Association of School Psychologists Annual Convention, Peer-to-Peer Mentoring Group meetings throughout Texas to support education agencies impacted by recent hurricanes, and the Youth-Serving Organizations Leadership Roundtable. During each #REMSonTheRoad experience, we had the chance to meet school, school district, and higher ed administrators; school resource officers and security staff; emergency management professionals; school social workers and counselors; and others with a stake in school and higher ed safety and emergency management to learn about issues faced in preventing, responding to, and recovering from emergency events. We look forward to our upcoming Webinar on Food Safety and Emergencies: Preparedness Activities for Schools with the U.S. Department of Agriculture, tentatively scheduled for April 5, 2018, at 2:00 p.m. ET (stay tuned for an official announcement), and upcoming train-the-trainer and train-the-educator trainings on the topics of threat assessment, resilience strategies for educators, and developing K-12 EOPs. Were you a training attendee? Share your experiences at any time with us via Twitter or our CoP (access the #REMSontheRoad Forums on the CoP). Have questions on SITE ASSESS? Post them to the Community of Practice forum we have created so that you can get support from us and others using the app. You can also email our technical assistance team at info@remstacenter.org. Have a Question? Need a Resource? Seeking Research Support? We’re Here to Help! Curious about a school safety topic? Wondering how to approach planning for a unique threat or hazard at your site? Need resources to support your higher ed emergency preparedness efforts? No matter the question or need, the REMS TA Center is here to help. We are available Monday—Friday from 9:00 a.m. to 5:00 p.m. EST to provide informed answers and related resources in response to your individual and unique questions on a wide variety of topics related to school safety, security, and emergency management and preparedness. Contact us via email, telephone, or our TA Request Form. If you have any questions or need additional assistance, please contact the REMS TA Center at 1-855-781-REMS  or via email at info@remstacenter.org.